Great Taste Magazine 2012 Jan/Feb Issue features Chef Greg Daniels and culinary news, tips, recommendations and recipes from Orange County restaurant chefs. 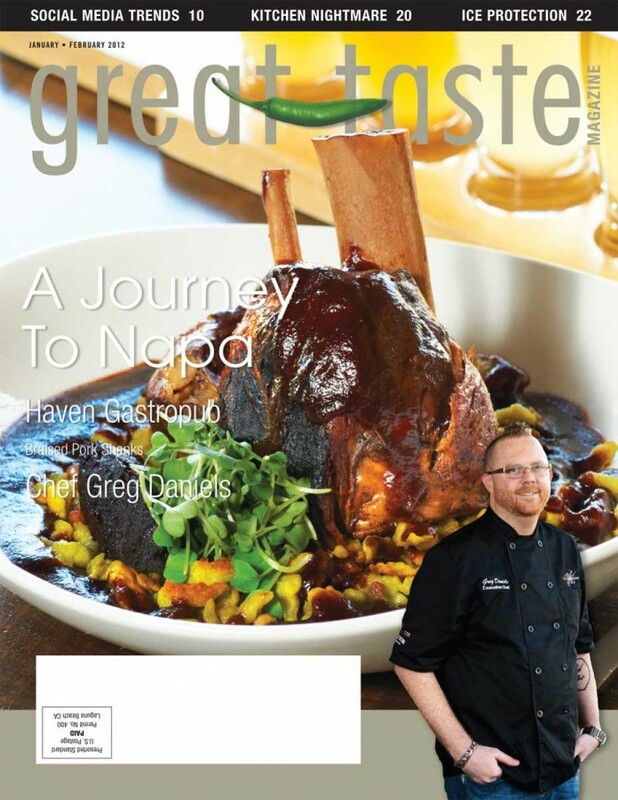 Take a Journey to Napa Valley in this issue of Great Taste Magazine. Join us as we tour the region to sample the local cuisine and taste the wines of the beautiful countryside. Journey back home to get to know Chef Greg Daniels of Haven Gastropub in Orange. He shares with us what inspires him as a chef, the importance of local, sustainable ingredients and even shares his recipe for the Haven Burger. Learn what’s new with The Beet, where we highlight what’s going on in the food industry from the new Chef at Tabu Grill to the new Yard House locations across the country. If you are looking for something to satisfy your sweet tooth, check out our Q&A with Casey’s Cupcakes, the winners of The Food Network’s Cupcake Wars. For the meat lovers we offer up some of the best shank dishes from around Orange County as well as Chef Daniels’ recipe for Braised pork shank. This issue we are also offering up advice on social media tips and tricks to help you not only attract followers but to keep them coming back, as well as how to protect yourself from ICE and the new Government crack downs on I-9s. We go inside Kitchen Nightmares with Luigi’s D Italia in Anaheim to see how the restaurant is doing now after its stint on the popular Gordon Ramsay show and hear what Chef Luigi Catizone has to say now about Ramsay and being on his show. As always we give you our produce pick of the month and tell you what is happening in the fish market. Finish your journey through our pages with a nightcap of moonshine and other spirits with a few recipes from the back bar of L.A.’s cocktail movement.